I love blueberry anything. And, I absolutely love the nutritious, versatile tigernut–specifically tigernut flour. I decided to experiment with my basic tigernut bar recipe and came up with these. These bars taste like blueberry muffins ! 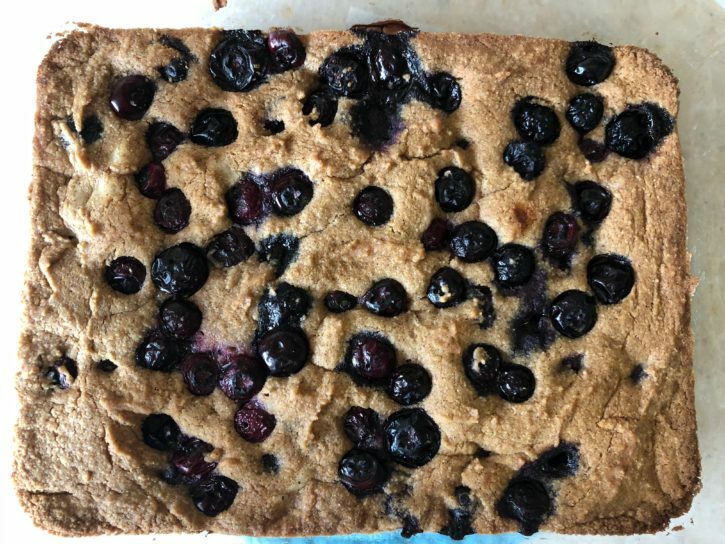 Due to the natural nutty sweetness of the tigernut flour and blueberries, I added no sugars. I wanted to create something delicious that didn’t have any added sugar whatsoever, as I chose to stop eating all sugars a few months back. These are a go-to for my breakfast with a quality protein. I also individually wrapped bars and took them on vacation, with them traveling well on an airplane. They also freeze well! 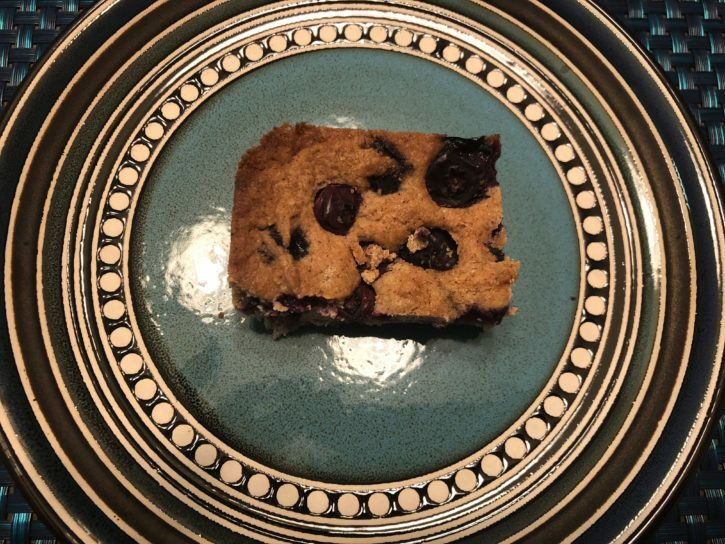 I’ve taken the pan of bars to get-togethers with friends, and they are gobbled up by non-Paleo people! Also, my good friend’s 10 year old child loved them and asks her mother to make them. So, kid-tested and approved! Gelatin egg: Mix 1 T of grass-fed gelatin with 1 T lukewarm water until the gelatin is wet. Will be like a thick paste. Pour in 2 T boiling or very hot water and stir or whisk vigorously. It will be liquid, possibly a bit on the thick side or frothy. Sift or whisk together the dry ingredients. Make sure any lumps in the flour are gone. Put into a medium-sized bowl. Add oil, vanilla, and coconut milk. Stir until well combined. Add the gelatin egg, Mix well. Fold in HALF of the blueberries, reserving the other half. Grease a baking dish (I used a Pyrex 9×7 dish) with some coconut oil. Add the dough and press it out until even. It should not be too thick or thin and spread nicely. If you have reserved half of the berries, pour them on top, spreading them out evenly, press lightly down into the batter. I use the bottom of the measuring cup to lightly press in the blueberries. Baking: Bake at 375 for 55 minutes or until the center is cooked. Inserted knife will come out dry. They may seem a bit soft in the middle, but they will firm up. Let the pan cool down when finished, then put into the refrigerator. Cool completely in the refrigerator. They will be firm and cut very nicely. Enjoy! For more great AIP-compliant recipes, check out Phoenix Helix!